Accusing Russia of practicing a “scorched-earth policy” in Syria is utterly hypocritical of CIA Director John Brennan who himself is largely responsible for nursing “moderate” rebels and plunging the country into chaos, former CIA officer Ray McGovern has told RT. RT: What are your thoughts on this suggestion that Russia uses “scorched-earth” tactics in Syria? Ray McGovern: I would say that John Brennan’s record for credibility or even veracity is rather thin. It’s really a case of people in glass houses not throwing stones or the pot calling the kettle black. These are crocodile tears. Brennan is largely responsible for the chaos in Syria. He’s the one that led Obama by the nose in response to the Saudi and to the Israeli interests there to keep the revolts going. He and Defense Secretary Ashton Carter were against the ceasefire. Ashton Carter sent his air force to scuttle the ceasefire that was agreed to between Secretary Kerry and Lavrov in September. So for Brennan to shed crocodile tears now, well I might say, it’s giving hypocrisy a bad name. RT: How would you define Obama’s administration efforts, its policy in Syria? RM: Well it’s hard to talk about “Obama’s” policy. Obama was led by the nose by people like Brennan, by people like Ash Carter, the Secretary of Defense. His policy was simply to sort of incline toward not looking soft. He didn’t want to look too harsh either. To his credit, I suppose, he didn’t send US troops in there, nor did he do whatever they wanted him to do and attack Syria overtly in September of 2013. But otherwise he said: “Well you know I’m lukewarm about this, but if you think we can call these rebels ‘moderate’, well maybe people will believe that.” The supreme irony of course is that three years ago Obama himself, when he was asked about these “moderate” rebels, said “that’s a fantasy.” His word – fantasy. RT: ‘Scorched earth’ is a really old-fashioned term, creating vivid images in mind. Why use it? RM: You know, Eastern Aleppo was inhabited by all manner of rebels. There were the “moderate” rebels, supported by the United States, there were al-Nusra, which were fighting hand in hand. They didn’t want to leave. 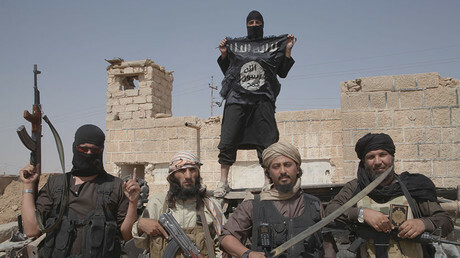 There was a ceasefire concluded on the 9th of September, which permitted them to leave, which mandated that the “moderates,” so-called, would be separated from the “immoderates” from al-Nusra. John Kerry said: “We have refined ways of doing that.” John Brennon said: “How we do? We don’t know who’s who.” And so they were never separated. Than the air force came in and attacked fixed Syrian army positions. The ceasefire was at an end and then the Syrian Army and the Russian air force did the rest of it. Yes, a lot of people got killed, but as many people got killed by the rebels as did by the government.